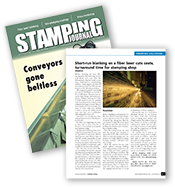 All-New Stamping works with a complete range of materials to satisfy even the most demanding specifications. We service a wide range of industries with a complete array of materials from stainless to plastics. Our equipment is capable of handling a wide variety of thicknesses and finishes. We offer complete traceability and documentation when needed. Our AS9100 and ISO 9001 certification gives our customers peace of mind that they are getting the best materials possible for their project. Stock width ranges from 1/4" up to 23-1/2"
At All-New Stamping, our customers come first, and our core values of listening to you and delivering a high quality product the first time and every time to bring added value to every part we produce. That’s what Power Satisfaction is all about. about Precision & Metal Stamping Materials?